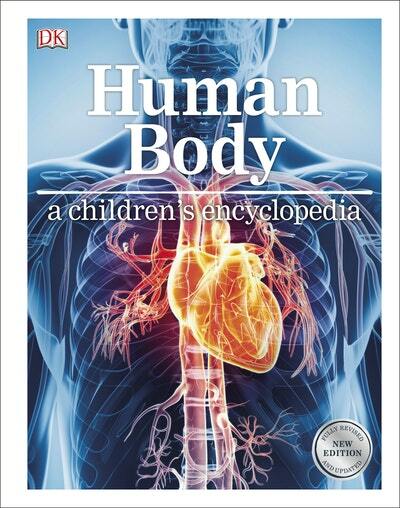 Help your child to understand the human body. This encyclopedia will knock spots off your biology textbook! Get under the skin of human anatomy with large, clear photographs, graphics, and CGI images that show everything you need to see in detail. Annotations and captions explain how everything works clearly and simply, without overwhelming. From the skin through muscles, tissues, organs, and nerves right down to your bones, you will be able to understand not only how your body works, but also your brain and the way you think, feel, and behave. The book is divided into twelve sections. The first ten chapters explore and explain major body systems including bones and muscles; the digestive system; lungs and breathing; life cycle; and senses. Within each chapter, most of the spreads are reference pages devoted to explaining how different parts of the body work - from how the heart beats to the tiny white blood cells that attack germs. Interspersed with these are double-page images that showcase amazing human body images, such as magnified views of individual muscle fibres and the villi that line the inside of your small intestine. The last chapter, Mind and Personality, covers the intriguing inner workings of the human mind, introducing the fascinating science of psychology. Finally, the reference section provides readers with quizzes to test their personality and reasoning, and finishes with a timeline of key medical breakthroughs. Love Human Body A Children's Encyclopedia? Subscribe to Read More to find out about similar books.